We all know the difficult year and a half that poor Tomas had to endure before he could begin proper training again. As he revealed at the end of the season, Arsene Wenger took the decision to rest him rather than play him in the last few games even if he was considered fit enough. It appears that Wenger’s action was obviously beneficial to Tomas as he is taking advantage of all this extra time to get even more fit and ready for the opening day of the new season. This he revealed in an interview given to a Czech paper “Sport.cz”. He reiterated once more that his knee is now back to normal without any problems. Tomas revealed that the doctors had suspected that the tendon was not entirely in order and may have needed to take radical action in a second operation. Now he is well again and doing all this fitness training. But only when he plays in a game will he know that he is back to normal. This can not be predicted or estimated, therefore I am full of expectations. There is no fear, but uncertainty”. All Gooners should not be surprised to see Tomas back in action very soon probably in the pre season friendlies. And what a fantastic addition to Arsene Wenger’s armoury this will be. 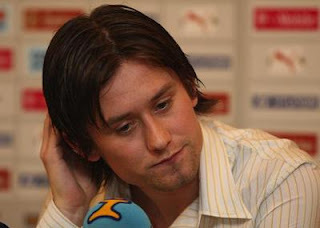 Tomas Rosicky will be like a new signing…. nice to have our number 7 back. Rosicky was supposed to be "THE" midfielder before he got injured. He was definately world class and pundits defined him to become one of the best midfielders in the world. I think he will make a huge impact to Arsenal because class is permanent whereas form is not. Oh, that's a great scoop....well done. 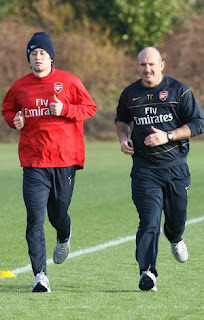 I can't wait to see that LIttle Mozart back in action. Strongly feel we need to hold onto Gallas for at least one more season, though. This is great news. Not only is Tomas Rosicky a truly world class player, but he also has the 'experience' tht we've been crying out for and missed last season. His return will also see competition for places which is a good thing. It will be interesting now to see where wenger really intends on using him on the pitch! i wish him all the best with his fitness, and hope he can come back and have a big impact. As i said last year this time, Ill be happy if either Rosicky or Eduardo come back. Both is too much to hope for. if both come back we need to sign no one for midfield or up front. yay I'm so glad he's doing so much better and I can't wait to see him in pre-season. He sounds a bit down, tbh. It makes me anxious to read his quotes over the last 6 months. I think this has been very, very hard on him and he's still not out of the woods yet. Get him on some anti-depressants, or maybe that's just his eastern european worldliness coming through. Either way I really hope he gets himself back to the top of his game for his sake. i always rate rosicky very highly. when he still play in germany, i wished wenger would noticed and sign him. i'm glad he come to arsenal but very sad when he out for so long. now we can see him in action again and im soo looking forward to it. when people blamed gallas for our meltdown in 07/08 season, i believe if rosicky stay fit for the whole season, we would have won premier league. rosicky, hleb and fabregas was the best attacking trio in premier league. This 's a good news and easily to fit is goes the beach and enjoys with this scenes for a couple of weeks. and with van persie, song, denilson, ramsey, fabianski, gibbs, wilshere on the bench..